We had a good day at the book sale on July 5, 2018, opening at 7:30 a.m. and closing down at 4:30. p.m. Our profits from the event were $662. Looked at another way, this is equivalent to about 33 memberships OR a little more than half a scholarship. Thanks to Ted, Eileen and Celina for working both days to set up the sale and helping at the sale. to Jeff for transporting the books to UBC on July 4, and to Jean who helped with sales on July 5. The BCP staff supported us enormously with this – particularly Amorie and Kim. And Thomas, at UBC, was genial and very helpful as he has been in past years. 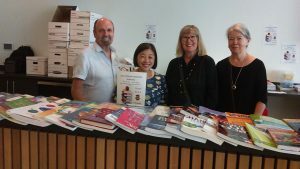 The photo shows the sales team: executive members Ted, Celina and Eileen and general member, Jean. Celina also designed the poster. Teamwork – always a strength!